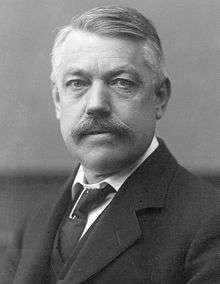 Christian Harald Lauritz Peter Emil Bohr (1855–1911) was a Danish physician, father of the physicist and Nobel laureate Niels Bohr, as well as the mathematician and football player Harald Bohr and grandfather of another physicist and nobel laureate Aage Bohr. He married Ellen Adler in 1881. He wrote his first scientific paper, "Om salicylsyrens indflydelse på kødfordøjelsen" ("On salicylic acid's influence on the digestion of meat"), at the age of 22. He received his medical degree in 1880, studied under Carl Ludwig at University of Leipzig, took a Ph.D. in physiology and was appointed professor of physiology at the University of Copenhagen in 1886. On his religious views, Bohr was raised as a Lutheran. He was an atheist in later life. Christian Bohr is buried in the Assistens Kirkegård. In 1891, he was the first to characterize dead space. In 1903, Christian Bohr described the phenomenon, now called the Bohr effect, whereby hydrogen ions and carbon dioxide heterotopically decrease hemoglobin's oxygen-binding affinity. This regulation increases the efficiency of oxygen release by hemoglobin in tissues, like active muscle tissue, where rapid metabolization has produced relatively high concentrations of hydrogen ions and carbon dioxide. ↑ Irzhak, L. I. (May 2005). "Christian Bohr (On the Occasion of the 150th Anniversary of His Birth)" (PDF). Human Physiology. MAIK Nauka/Interperiodica distributed exclusively by Springer Science+Business Media LLC. 31 (3): 366–368. doi:10.1007/s10747-005-0060-x. Retrieved 2008-05-22. 1 2 3 4 5 6 7 8 9 Politiets Registerblade [Register cards of the Police] (in Danish). Copenhagen: Københavns Stadsarkiv. 7 June 1892. Station Dødeblade (indeholder afdøde i perioden). Filmrulle 0002. Registerblad 3341. ID 3308989. ↑ "Niels Bohr". Assistens Cemetery in Copenhagen. Retrieved 2008-05-22. ↑ Rhodes, Richard (1986). The Making of the Atomic Bomb. New York: Simon & Schuster. ISBN 0-671-44133-7. ↑ Tom Siegfried (June 28, 2013). "When the atom went quantum - Bohr's revolutionary atomic theory turns 100". Society for Science & the Public 2000. Retrieved 1 July 2013. As for standard religion, though, Bohr was unsympathetic. His mother was a nonpracticing Jew, his father an atheist Lutheran. ↑ Bohr C. Über die Lungenatmung. Skand Arch Physiol 2: 236–268, 1891. Fredericia, L.S. (1932) Christian Bohr, pp. 173–176 in: Meisen, V. Prominent Danish Scientists through the Ages. University Library of Copenhagen 450th Anniversary. Levin & Munksgaard, Copenhagen.